WordPress or Blogger? Which one is better? The question of 'WordPress or blogger?' has become the most frequently asked question by people who want to start blogging. Sometime, it is become a question from people who have already run one of blogging platform and did not satisfied by the blogging platform he/she used. For me, it is become a question since i still don't completely understand why so many people recommend WordPress over Blogger? I do understand the explanation but still do not see it in my blogging life. I mean, i can achieve my blogging goal using Blogger without spending anything on Web Hosting service and plugins like WordPress do. I believe this article is not the first article that you read about WordPress and Blogger comparison. At least you might ever heard people talking the difference between these two blogging platform. I believe also, almost article talking about WordPress or Blogger comparison always come up with decision that WordPress is much much better platform than Blogger. WordPress or Blogger, which one is better? Below is the result of Google search on this topics. So i made this article to give another opinion of this comparison between WordPress and Blogger. I used blogger and WordPress.com since 2005. I also run some blog using WordPress.Org since 2015. I spent a lot of time in Blogger than WordPress. I did not find any major obstacles that made me migrate completely to WordPress. Maybe if i spend more time in WordPress i will have the same opinion with the other writer. I do not know. At this present time, i still comfort using Blogger over WordPress. What is Good about Blogger? Enough talk, lets try to examine Blogger benefit over WordPress from Blogger User perspective. This is one of the main reason for me to choose Blogger as my blogging platform. It is free. We don't have to spent money for the hosting service. We can use until 15 GB of data. Most of blogger that write article about WordPress and Blogger comparison is become affiliate partner of some web hosting service. In the end of the day, when you come to conclusion of choosing WordPress over Blogger you will need the web hosting service. These service is scatter around as advertisement in the blog that write about this comparison. For some people, the web hosting cost is cheap and can be covered by the revenue from the blog. However for newbie Blogger that is still learning, the cost will not be covered. In additional, a lot of people run a blog as side job or hobby. They spent only small amount of time for blogging. Sometime they completely forgot that the had a blog. For those people, running a blog on WordPress could be just a waste. They will lost the blog that they build for one year because they do not maintain the blog and forgot to extend the Web Hosting or Domain service. Do you have the same experience? I did. I can say this because I'm is one of them. I have two blog running on WordPress self hosted and failed to write consistently on them and then forget the Blog. I did not extend the Web Hosting and Domain Service after one year. All the writing that i made during one year is gone and not accessible because i did not extend the service. I'm wondering how many WordPress blog that is abandoned by the user because of this. If you are a newbie blogger that is still in searching your blogging interest and blogging as a hobby, i suggest you use Blogger instead of WordPress. For the serious blogger, you can run on WordPress self hosted or Blogger with custom domain also. Matt Cutt the Google Webmaster said " If you just want to do casual blogging, if you just starting out, Blogger is fantastic"
I hope i can be one of the serious blogger who successfully running on Blogger platform. This is also the other main reason for me to choose Blogger as my blogging platform. It is support custom domain. The free WordPress.com does not support custom domain. I will talk latter about the comparison between WordPress.com and WordPress.org. By having custom domain, we can have a blog that looks and feel professional. WordPress.Org for sure support custom domain since we need Web Hosting and Web Domain to blog in WordPress.org. Running blog on Blogger, we need only to spend money for the Web Domain and no need for the web hosting. Blogger also offered the Blogspot.com domain if we want to have completely free blog service. Right now even we can use https in our Blog in Blogger with custom domain. People said that WordPress is very easy to customize compare to Blogger. I have different opinion about this. For the record, i'm not a programmer geek that understand all the programmer language. Blogger template come in XML file type, meanwhile WordPress template come in a zip file consist of a lot of file. For me, it is easier to modify Blogger Template than WordPress template. It is quite complex changing the blogger layout in 2005. We have to write everything in XML code. Blogger has improved this gap and provide a built in blogger theme designer that can be used to change blogger appearance with live preview. It is perfect. Own by Google, Blogger platform is safe and reliable. We don't have to worry about the security. Matt Cutt said : "Blogger is very easy, it is in the cloud, you don't need to download, install or patch the blog. Since Blogger is in the Cloud, you don't have to worry about going to be hacked". WordPress platform need self hosting, the security and reliability are depend on the web hosting provider. We also need to patch the software regularly to avoid hacking. Blogger is also reliable. It is manage by Google. The up time will be 99.99999%. We never heard Google server down. The reliability of WordPress blog service is depend on the Web Hosting Company that you used. They have maintenance some time and can not up and running in full 100%. I do not find term multi site on Blogger platform but it has the feature. We can use one Google account to host hundred blog. The set up of new blog is very easy. WordPress is also offered multi site blog. I found the setting of WordPress multi site is a lot lot more complicated than Blogger. The WordPress multi site allowed WordPress user to run more than one blog in one hosting. It took some setting and quite advance WordPress knowledge to do that. In Blogger we can run multiple blog in one Google account in very easy way. It is my opinion. Could be right or wrong. I feel more comfortable writing in Blogger since my page is easily being indexed by Google. Based on my observation in Google search result page, it is very often we find a blog with Blogspot.com domain in our search result. Matt Cutts said different thing about Blogger and WordPress in term of SEO advantages. He said that both of Blogger and WordPress can rank very well in search engine. If you have good link and great content so it absolutely the case that you can rank better in search engine. Blogger is integrated with Google AdSense, Google Analytic, Google AdWords, Google Drive, G+ , Gmail and other Google Service. It is easy to manage. Sign in on your Blogger account will make you sign in on other Google services. Blogger is easy to set up and manage. If you want run multiple blog at one account, you can do it directly from the Blogger dashboard. No need to set up multi site pluggin just like in WordPress. Creating a blog in Blogger is almost like sign up in social media platform. You do not need to understand CPanel, installing the software on the server side, create database and other effort like what we did in WordPress self hosted installation. What is Bad about Blogger? is it true? People said that the blog that is created in Blogger is belong to Google. This statement is not true. For me the statement is doesn't make sense. We create the blog, we can edit the blog, transfer the blog, back up the blog or even deleted the blog. We own the blog completely. So what is the definition of own by Google? Is it because Google can delete our blog? Google has policy and term of service, as long as we follow the Google policy and term of service, Google will not delete our blog. And the funny thing is, most of the blogger want to use Google AdSense to monetize their blog; and for sure they have to follow Google policy and Term of Service. So we have to follow this policy and term of service anyway. We have to follow Google policy. For me this is not a set back unless you want to make a content that against Google Policy like terrorism and piracy. Running on Blogger is mean that our blog should follow Google Policy. So our blog is more ready for Google AdSense application. This is true. WordPress offer unlimited customization. It is supported by large community and it is open source. There are many plugins that only available in WordPress and we do not find it in Blogger. So it is depend on what you need. Do you need the feature that is offered by WordPress self hosted platform? Is there any feature you need that not available in Blogger platform? It depends on your need. However, Blogger over easier theme customization. Being a blogger, we need some basic coding of XML, HTML, CSS, Javascipt and JQuery. If we understand the language, we can customize blogger as we want. Currently Blogger does not support SSL or https for custom domain. Google give httsp in blogspot.com domain. It is a bit unfortunate since the https has good impact on SEO. I hope in the future Google will support SSL for custom domain. However, right now this feature are available in draf.blogger.com. My Blog on blogger with custom domain has use SSL in the blog address. You might noticed that all the post in Blogger platform always have internet address (permalink) with involving years and month information. This is the only option that we have right now for Blogger. WordPress are superior on this. There are several option of permalink structure available in WordPress self hosted. Most of blog or website that is sold in blog market are created with WordPress. It is very rare people sell or buy a blog in Blogger platform. I browse some website sold in Flippa.Com, the first marketplace for buying and selling website. From 10 of random website i checked, all of them are running on WordPress. I can not find a website sold in this market place that is running on Blogger. So if your goal is developing a blog and selling them, Blogger might not be the best choice to consider. So if your goal is developing a blog and selling them, Blogger might not be the best choice to consider. 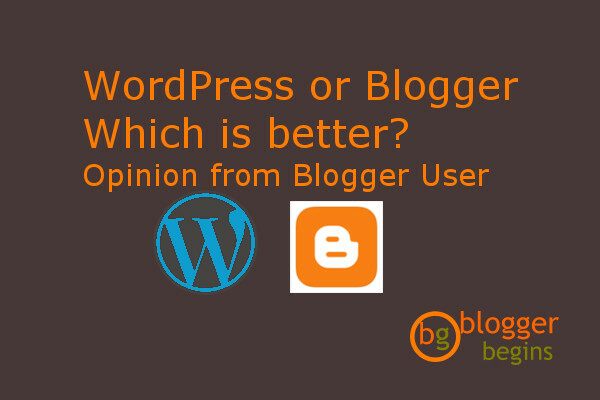 Conclusion : Which is better, WordPress or Blogger? So it come to summary and conclusion. Blogger has a lot of good things offered but it also has some weakness compare to the WordPress self hosted platform. If we just want to do casual blogging, Blogger platform is fantastic just like what Matt Cutt said. Blogger is easy, free, safe, integrated, Google friendly and reliable. For the beginner blogger it might be the best blogger platform to start. The bad things about Blogger that scattered around in the internet might not completely true. We still own our blog despite of Google capability to delete our blog. But some weakens are true like the limitation of permalink structure, doesn't support SSL for custom domain and it has limited feature compare to WordPress self hosted. So Which is Better? WordPress or Blogger? It will depend on your need. In the end of the day, our needs will be the judge to determine which one is better, Blogger or WordPress. It is always depend on the need. The gun is good for shooting but not for hammering. 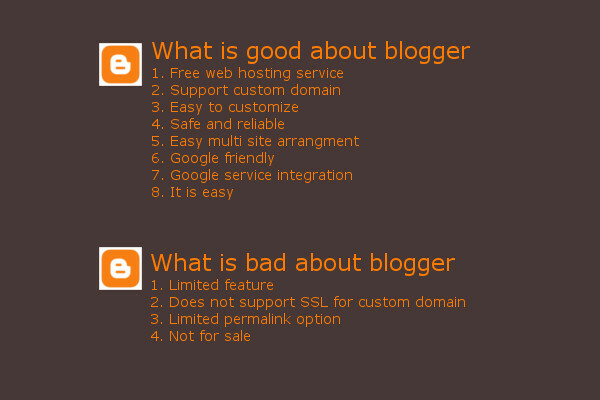 Below is the summary of the good and bad things about Blogger as summary. What is good and bad about blogger? For me, according my need right now, Blogger is better than WordPress. I'm happy blogging using blogger. Blogger can full fill my expectation as blogger platform that can be monetized using Google AdSense. It is free, easy, safe, reliable and Google friendly. I can not ask for more. So, how about you? Which one do you prefer? Please share your comment and thought here. Thank you for reading this long post. 1 Response to "WordPress or Blogger, Which is better - from Blogger User Opinion"
This is a nice post. thank you sharing this with us, keep posting..